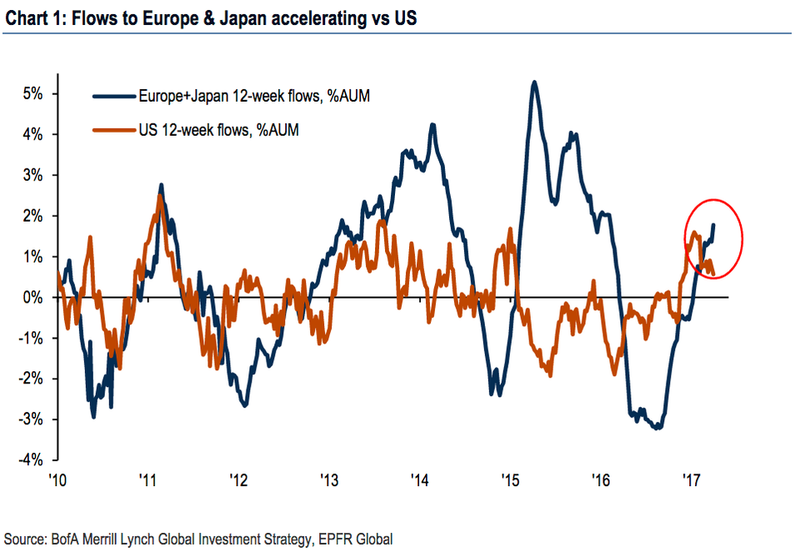 The era of the US market’s leadership among global stocks is ending. Since the bottom in March 2009, the S&P 500 has climbed by 254%, and investors who have been consistently putting their money into US companies enjoyed some nice returns on the way up. “Economic data complemented by relative shifts in central bank policy suggests 2017 will be a year in which US risk assets relinquish their recent leadership to markets in the rest of the world,” said Brian Nick, the chief investment strategist at TIAA Investments. The relatively high valuation of US stocks signals that returns may be lower than expected in the next few years, Nick said. Several emerging markets are much cheaper. Relative to the US’ 8-year-long recovery, some countries like Brazil are just pulling out of recession. Additionally, the strength of the US dollar makes the rest of the world attractive on a currency basis. All this means that it’s time for US investors with a heavy home bias to start to diversify. “People can get away with owning only US companies, but cannot get away with that in a place like Belgium,” Nick told Business Insider. US stocks are the most overvalued since the 2000 tech bubble, judging by the cyclically adjusted price-to-earnings ratio. It’s not unusual for the S&P 500 to trade above its average CAPE ratio. But with stocks this expensive, investors should expect milder returns on a five to 10-year horizon, Nick said. Additionally, high expectations for tax and fiscal policy have already hit roadblocks in the first 100 days of President Donald Trump’s term. The so-called Trump rally lifted the Dow Jones industrial average to record high after record high. But it stalled in March as the American Health Care Act imploded. Some analysts had expected a pullback ahead of the first-quarter earnings reporting season, which could show that profit growth is catching up to the rally in stock prices. But even if earnings pick up, Nick anticipates that the market’s gains over the next several quarters would be small, especially if outflows from the US pick up. Nick’s preferred destination is the Eurozone, where a number of key elections this year could create some volatility. A good country in Europe to look at is France, the “epicenter of risk,” Nick said. An election on April 23 — with a possible run-off election on May 7 — could make the far-right party leader Marine Le Pen president. “Political risk has been mispriced because I don’t think the adverse election outcome is as likely as the market is making it seem,” Nick said. On the other hand, he added, US investors are underestimating the risk of policy delays and flops like the failure of the AHCA. It appears that US investors are already moving some capital elsewhere following the failure to repeal and replace Obamacare. Outside Europe, Nick said India is another preferred market. Its equity market is one of the best performers in the world this year amid optimism that Prime Minister Narendra Modi will implement his reform agenda. Mexico is another market to consider, he said. Its economic ties to the US could be strengthened under the new administration following some positive comments from officials including Peter Navarro, Trump’s trade adviser. Nick pointed out interest-rate US sectors like real estate, consumer staples, and utilities, which could be vulnerable to policy disappointments, as sectors where one might want to reduce exposure. However, sectors linked to economic growth like consumer discretionary and tech should continue to do well.